Christmas Sermon preached on Matthew 1:18-25 by Rev. 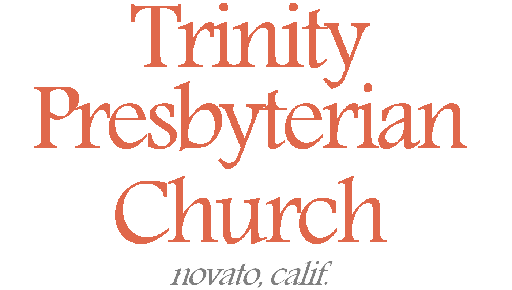 W. Reid Hankins during the Morning Worship Service at Trinity Presbyterian Church (OPC) on 12/21/2014 in Novato, CA. Audio recording not available for this session, due to technical difficulties. We come again to celebrate the birth of Jesus Christ! Matthew’s account of the birth reveals to us the virgin birth of Jesus, but especially from Joseph’s perspective. And so we are brought right away into what seemed like a scandalous thing to Joseph. Here we see that Mary was betrothed to Joseph. She was to be his wife. But before the actual wedding, Joseph discovers that Mary is already pregnant, and he knows that he is not the father. And so Joseph assumes Mary has been unfaithful. That’s a legitimate conclusion under normal circumstances. Being a righteous man, and clearly a merciful man, he plans to break off the marriage with her in a private way, surely intending to save her from being stoned to death (that would have been her punishment per Deuteronomy 22:23 for such an infidelity). But before Joseph can send her away, an angel from God intervenes. Joseph receives an angelic explanation of the matter. He’s told that Mary was not unfaithful, but rather this is a child from the Holy Spirit. In other words, he learns that this is a virgin conception! And so Joseph heeds the angel’s message and does take Mary as his wife, and does not consummate the marriage physically until after baby Jesus is born. And so when we celebrate the birth of Jesus there are many aspects of that birth which we celebrate. So many of those are recorded right here in Matthew’s account. You have the virgin conception and birth. You have the revelation that Jesus is the promised savior, that king that would come in the line of David. And you also have the revelation that Jesus is also Immanuel, God with us! That gets at the incarnation, that God has come to man in the person of Jesus Christ. And so it’s this idea of Immanuel, God with us, that I would like us to especially reflect on this Sunday before Christmas. I would like us to think about how Jesus is called Immanuel. We’ll think about this idea of Immanuel in three points. First, we’ll consider the background prophecy from Isaiah that Matthew says explains what’s going on here. Second, we’ll consider the virgin conception and birth as it pertains to the idea of Immanuel. Third, we’ll think specifically about this phrase Immanuel, and its significance. Let’s begin then with this background prophecy. Look with me at verses 22-23. And so this is Matthew’s commentary on this story we just read and summarized. Matthew is saying that the miraculous conception of Mary is the fulfillment of a prophecy uttered long before. This is from the prophet Isaiah, Isaiah 7:14. We read some of that chapter earlier in the service. Now it’s easy enough to see how Matthew applies this prophecy to Jesus. It’s a little more complex if we try to go back and look at how it was used in Isaiah. You see, when you go back to Isaiah 7, it first sounds like this is something that you might have expected a fulfillment at that time. Isaiah 7 is about the troubles Ahaz, King of Judah, was facing at that time. Ahaz was a king in the line of King David. And he was a bad king, not doing what was right in the sight of the Lord. And Ahaz’s trouble in Isaiah 7 was that two other nations had joined up to try to attack him and the nation of Judah. Sadly, one of them was their brother-nation Israel, the rebellious northern kingdom, and the other was Syria. However, the prophet Isaiah came to encourage King Ahaz that Israel and Syria’s plans to conquer them would not succeed. Isaiah then tells King Ahaz to ask God for a sign as proof that this would be true. King Ahaz refuses to ask for a sign, saying he didn’t want to test God; that almost sounds holy, but since it was God himself who told him to ask for such a sign, that wasn’t the right response by Ahaz. So God then proceeds to give Ahaz a sign anyways. That’s when Isaiah offers this prophecy about a virgin birth. And the prophecy in Isaiah goes on to sounds like it’s saying that while this child is still very young, the problem with these two other nations will go away. What’s interesting is that the next chapter in Isaiah describes Isaiah himself having a child that almost sounds like it’s the immediate fulfillment of the Isaiah 7 passage. And clearly in Israel’s history, these two nations of Israel and Syria were not successful against Judah. And yet in Isaiah 7 and 8, things don’t end that rosy for Judah. Yes, there seems to be some initial salvation for King Ahaz and all of Judah. But you see, it talks there about how Israel and Syria will be destroyed by Assyria. In fact, that was Ahaz’s doing. Ahaz had asked the Assyrians for help. The problem of course, is he should have asked God for help, not the evil, wicked, Assyrians. And so Isaiah 8 describes how after Assyria destroys the threat of Syria and Israel then they will become a trouble to Judah. There are two more references in Isaiah 8 to Immanuel. The references there seem to encourage them that God would be with them, even then, with this Assyrian trouble. But it also seems to describe that they would nonetheless have some serious troubles with Assyria. So, if the book of Isaiah seems to show some kind of initial fulfillment of this virgin birth passage all the way back in Isaiah 8, then how is that Matthew could find it’s fulfillment here with Jesus? Well, as is so often the case, there can be a complexity to the fulfillment of prophecy. And when you go back to Isaiah 7 and 8, one thing that is clear is that this son born to Isaiah, if he was in any way a fulfillment of the prophecy, it was not a virgin birth. Isaiah 8:3 seems to describe an ordinary conception for that child. Furthermore, as you read on in Isaiah, there are continued prophecies of a coming child, and they seem to speak back at least in part to this one in Isaiah 7. Isaiah 9:6, for example, is the one that speaks of a coming child that will be called “Isaiah 9:6 Wonderful, Counselor, Mighty God, Everlasting Father, Prince of Peace.” That chapter in Isaiah 9 helps us to think more about this whole idea of Immanuel. That there would come a child that would be born of a virgin who would truly be God with the people. This would be so much the case that this coming child would even be called “Mighty God.” And that Isaiah 9 passage talks about how this coming child would have an everlasting kingdom. And so regardless of how Isaiah 7:14 may have seen something that looked like an initial fulfillment during those days, it clearly didn’t reach its fulfillment in any full way, until what we read today in Matthew’s gospel. Matthew can see that regardless of what ever initial fulfillment that did or did not take place back in Isaiah’s day, the ultimate trajectory of Isaiah 7:14 looked forward to what would happen with the birth of Jesus. Of course this is a typical thing that we see in the Old Testament. In the midst of so many promises for the Messiah, we see candidates rise up along the way, leaders among God’s people that in many ways were very commendable; parts of their lives looked like at first they might be the promised Messiah. But yet something in their life always showed that they were not actually the promised one. David himself is one easy example. God made him king and said he was a man after God’s own heart. But it’s easy to see some of the big sins that David did, with Bathsheba, and Uriah the Hittite, and later with an unauthorized census, and other examples could be given too. David was a man of God, but not perfect. God was with him, but he wasn’t God with us. And so Matthew tells us that this Isaiah 7:14 passage ultimately looked beyond the days of King Ahaz and Isaiah to the birth of Christ. Christ’s birth truly was a virgin birth in the full sense of the word. Let’s turn now to this second point. When we read Matthew’s commentary by quoting Isaiah 7:14, we understand precisely this. This child born of a virgin, means exactly that. Mary was a virgin. She was not married and had not been with a man. There was no scandal here. No scandal, rather a miracle! Jesus’ conception and birth was a miracle. That’s the point! There are many cases in the Old Testament where some key child was born for redemptive history by God miraculously overcoming someone’s barrenness. Sarah giving birth to Isaac, Rebekah giving birth to Jacob, Rachel giving birth to Joseph, Hannah giving birth to Samuel, as examples. But here God does something greater. Here God doesn’t just overcome barrenness. He overcomes virginity! He is able to have Mary conceive in a way that never has happened before, and never will happen again. The Westminster Standards describe this as not ordinary generation. That is for sure. The conception and birth of Jesus was a miracle of miracles, and it was the work of the Holy Spirit, according to the Scriptures. That’s what the Angel Gabriel told Mary in Luke’s gospel. In Luke’s gospel it explains that the Holy Spirit would overshadowed Mary. And it’s that role of the Holy Spirit that is also again emphasized in Matthew’s account. Verse 18, it says Mary was found with child of the Holy Spirit. And again in verse 20, the angel tells Joseph that the child conceived within Mary is of the Holy Spirit. And so I can only begin to fathom this, but this is what we are told. The Holy Spirit was the agent of this miracle within Mary. And yet this explanation, as hard as it is to get our minds wrapped around it, is nonetheless understandable. It’s what satisfies Joseph’s previous concerns about infidelity with this explanation. Surely, Joseph didn’t understand how such could be possible any better than we can today. But it was enough to believe that it was the case, because the angel told him it was true. And we believe because the Bible tells us it was true. You see the difficulty in understanding this virgin birth is when we want to try to have some physical explanation. That’s what people too often try to do with miracles in the Bible. They want to explain how they are physically possible. That’s why some today want to deny the virgin birth, because they don’t believe it could physically be possible. But that misses the whole point. Miracles are miracles, and this one is especially amazing, for this very reason! The reason why they can happen is not because they are physically possible. Rather, what makes them a miracle is that is not otherwise possible. A miracle is something that only God can do! God can do what is for man impossible. That’s what takes place here. As we think about this virgin birth, I’m particularly interested today in connecting it with the concept of Immanuel. What becomes clear in this passage is that Joseph is not the physical father of Jesus. Joseph is the adoptive father of Jesus. Since it was the Holy Spirit who miraculously brought the conception into Mary, Joseph did not physically father the child as would ordinarily be the case. In Luke’s gospel, Luke 1:35, we are told that the fact that the Holy Spirit caused this miraculous conception to happen, means that the child will be called the Son of God. And so as we think about Jesus being the Son of God, that is particularly relevant to this Immanuel idea. For Jesus to be Immanuel, God with us, he is that in a unique way, just as Jesus’ virgin birth was a unique event among all humans born into this world. Jesus is Immanuel as the divine and eternal Son of God coming to man by taking on flesh and being born of Mary as a baby boy. This understanding is yet further confirmed in John’s gospel, speaking of the eternal Son of God becoming flesh, that we would behold the glory of God among man, John 1:14. And that’s what Jesus was when he came. The Son of God has existed from all eternity, but it wasn’t until the birth of Jesus that he existed in human flesh, living among humans on earth. And so at this virgin conception and birth, the eternal Son of God came into the womb of Mary and became human. Yes, he was also still divine too. But yet he took on a human nature. So when he was born as a human baby boy and named Jesus, he was literally God with man. He was the divine in human flesh. He was Immanuel in the most literal way. What a wonderful thing this was. You see, in the Bible, it’s this desire that we see throughout the Scriptures. The Bible is throughout showing how important it is for God to be with us. One statement that comes to my mind a lot on this subject, is the line that God keeps telling people to encourage them in the midst of some obstacle or trouble. He says something to them such as, “Fear not, for I am with you.” Now, whenever he’s said that along the way in the Bible, it’s very true. God was with those people that he told them that. But he was with them spiritually, not physically. It was the Immanuel idea, but a spiritual experience of Immanuel. So, that is what is so amazing that when that first Christmas happened, that the Immanuel concept became a physical reality. God was with us in a physical way. It was a theophany, an appearing of God. And yet, still more than just a theophany, because the burning bush for Moses was a theophany. But the birth of Jesus was something better than a burning bush! It was God coming to man as a man. And so if it was true that God being with his people is a reason to “fear not,” then that is certainly the case with the birth of Jesus, Immanuel. The presence of God is a reason to cast off fear for God’s people. And that is certainly the case when Jesus is born. When you go back to that Isaiah prophecy it talked about how the birth of the child would coincide with a victory for God’s people over their enemies. Well, that has all the more come to pass with the birth of Jesus Christ. As Immanuel he came to earth, and ultimately went to the cross so that our enemies of sin and death would be destroyed. We see that of course in this passage, that his name of Jesus tells us that he will save us from our sins. And so as the God-man he comes to earth to accomplish a mighty salvation for his people. He does this by going to the cross and dying in our place, paying the price for our sins, and conquering death’s hold on us. The gospel now tells us that whoever believes in him will not perish but have eternal life. And so as we celebrate Christmas, we are celebrating God coming to man. Immanuel is realized in the best way at the incarnation. As we reflect back on Christmas, we praise God for this amazing event, and how it resulted in our salvation. And this is also something that makes us look forward. If this Immanuel idea was so amazing at Christ’s first coming, it will be even more amazing when Christ returns. Because then Immanuel will be with us, then again in the flesh, but in our glorified bodies, to take us to paradise! And yet, as we live in the mean time, between the two comings of Christ, may we not disregard the importance of what Jesus told us before he went back up into heaven. He said to the disciples then and continues to say to us today, “I will be with you always, even until the end of the age.” So, Immanuel, God with us, is still with us. Yes, true, this is spiritually true now. It came to realization at the day of Pentecost when Jesus poured out his Holy Spirit on his disciples. All Christians continue to receive that baptism of the Holy Spirit. So Immanuel is still with us! Yes, it’s not quite the same as when he was physically with us in the flesh. We certainly long for his return. And yet, don’t disregard how amazing the pouring out of the Holy Spirit was in redemptive history. Jesus said before he poured out the Spirit like this, that it would be for our benefit that he goes back up to heaven, because it would be so good for us to each receive his poured out Spirit. Immanuel then is with each us as Christians. What does this mean them? It means that what we celebrate at Christmas, God coming to man, is a spiritual reality for every Christian, each and every day. Because as a Christian, since the Immanuel reality is still at work in each of us, we should rejoice in the benefits. The mighty God who has come to man, is at work to save us from our sins. What I mean is that not only does he work to strengthen and establish us in our faith, so we can know that we’ve been forgiven of our sins; but he also is working in us to have victory over sin. Now for sure, none of us will experience complete victory over sin in this life. But for the mighty God to come to man to save us from our sins, is not only about bringing forgiveness. It’s also bringing deliverance. That we would be freed from our struggles with sin that keep rebelling against God. Since we have Immanuel with us, God in us is at work in our hearts to bring us salvation from sin. So, in our struggles with sin, we can “Fear not, for God is with us.” Fear not, because of the reality of Immanuel! Live and act in light of this reality. Rejoice in Immanuel within you. God is with us as Christ is with us. Celebrate this truth; live in light of this truth. It’s like Joseph, he acted in light of the truth the angel told him, truth about Immanuel within Mary. He obeyed the angel of the Lord. May we too seek to obey God in light of Immanuel within us. Praise be to God, and blessings of Immanuel be upon you all. Amen.